Anthony V was extremely efficient and helpful. He told me everything he was doing and performed his tasks quickly and in a highly professional manner. SafeTouch is truly an exemplary and highly trustworthy company. Joel F. is a great technician with Safetouch. He’s been to my house twice and has done a wonderful job both times. He makes double sure that everything is working to perfection with my security system and that I am satisfied with the job before leaving. ALLEN B. WITH SAFETOUCH DID A FANTASTIC JOB!!! HE KNOWS HIS JOB WELL!!! Steven was very professional. Answered all my questions and got the app downloaded for me. He explained the system very well. Thanks Steven!! John B was very helpful. He corrected my problem and checked everything out. Very polite. Thanks John! Rich was wonderful. He was very knowledgeable and patient! Love the new IQ panel. Give him a raise ! The installation was very professional. Mark G. is a excellent technician. Mark completes the job fast and efficiently. Mark is courteous and professional. If I were able to request a technician, I would request Mark. Mark G. Arrived in a timely manner, was personable, fixed the problem, and answered some questions that I had. I am more than satisfied with the service he provided. My appointment was scheduled between 8 and 10 AM. Anthony V. arrived right at 8:02 Am. He checked system and inform me of the situation. Anthony V. was professional and approachable. He was very thorough. Would like to thank John B. for the very professional manner in which he installed our new Safe Touch Security System today. He was very knowledgeable about how the system worked and answered any and all of the questions we had about what he had installed for us. Also he took a lot of pride in what he was doing and did an outstanding job in doing it. Safe Touch has been our security system for years. Today, Nick B. came to inspect all the devices throughout our home. He replaced all the batteries. His work was quick and efficient. He was also very professional. Safe Touch is a great company and we've always been pleased with their service. Safetouch is a wonderful security company. I recently had an issue with my security system on a Sunday afternoon and while the customer service representative did everything she could to get the sytem to reset, it just would not do so. She contacted the service supervisor who told her to put me on the schedule for the very next day and that a technician would be out to take care of the issue as soon as possible. On Monday, I received a call advising the technician was on the way to my home to repair my system. He arrived a few minutes before me and was very polite and kind. He quickly identified the problem, a malfunctioning smoke detector, replaced it and had everything back "on line". I can't say enough about the customer service and professionalism of Safetouch Security Systems. I am definitely a happy customer! Joe E is a very professional service man. Joe has done service on our system before and is always friendly and on time. He knows his business and does it well. 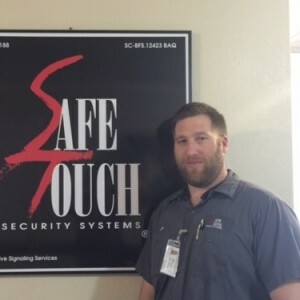 Thank You Joe E. for being our man from Safe Touch Security. *** was extremely polite the entire time he was here. The problem was fixed quickly. He stayed around to make sure everything was working and explained how our problem occurred in the first place. He was very good about answering any questions we had. He was very polite, helpful, and professional. Everyone was curteous and gave good service...my issue was that i had argue to make sure i would not be charged for the service call..i changed my internet...i was told that things had changed and comcast did not have to be called...but when i called safe touch, i was told that i would be charged $125. Since i had been with safetouch for ten years and have always paid my bill and never had new equiptment, i thought i should not be charged. When the technician arrived, i was told there would be no charge for the first hour ONLY...then it was discovered that the modem was too ancient to use, so i would not be charged..This was stressful...in this age of loyatly bonuses, shouldn't loyal customers of Safe Touch deserve some type of appreciation, or do we have to threaten in order to get what should be done? The first scheduled technician arrived ten minutes past my assigned time window, then said he would not be able to complete the job before I had to leave (3 hrs of my time wasted). The second technician arrived promptly at his assigned time, but was curt and unsocial. He told me he did not have a ladder to get up into my attic, and may need to reschedule. When I told him we had already rescheduled once, he rudely replied, "Well I can't just jump up there." I suggested that maybe the techs should be better prepared for a known job. I ultimately let him use a ladder of me own. At one point during the job, I tried to intervene with a question, but Ed abruptly cut me off with a "Done in a minute.." as he walked by me. I had to pull information out of him about what was going on. Ask for Joe E. as your technician. Joe was very helpful and he took care of the issue right away. David was very professionally and knowledgeable about the products. My Husband and I have several questions about surveillance products and he answered them all. Once we decide to purchase our options have been decided. Thanks!!! Punctual and friendly service from Joe E. at Safetouch. Joe identified the problem and corrected it quickly, while providing excellent customer service. Thanks Safe Touch!! The tech. arrived on the time, just as we asked. He fixed the problem for us and I was very impressed with how courteous, polite,and very professional. I also noticed that every time he came back inside my home he cleaned his shoes off as he should. I really appreciate that. I cant say enought good things about this person. I would highly recommend him. Joe E was our technician. He was prompt, courteous, and knowledgeable. He was able to diagnose the problem with our system and and had it repaired within approximately one hour. If Joe is representative of all of the employees at Safe Touch, the companies future is in good hands. Joe was wonderful. He was very helpful and explained things. He had to go up into the attic and didn't complain. He had a great personality & an all around good guy. Agent and tech were helpful and courteous. Tech discovered other problems and handled before leaving. *** * was very professional and knowledgeable about his job and performed everything very efficiently. Was eager to be of assistance and solved all our problems quickly.